According to recent OnDevice research, nearly 25% of Americans are mobile only, meaning they never or rarely access the Web via a desktop, laptop, tablet or similar device - and the mobile-only generation is expected to grow. For enterprise-level organizations looking for a hassle-free time and expense solution to get better visibility into project cost, improve professional services billing, or track time and attendance to ensure labor law compliance, the solution is as close as the nearest iPhone. According to aggregated data collected by cloud-based timesheet and expense management software creator Replicon, businesses and organizations are embracing the company’s recently released iPhone time tracking application in record numbers, and companies have quickly realized a bevy of benefits. Since releasing the Replicon Timesheet application in the fall of 2011, the number of users logging into the market-leading timesheet platform via an iPhone, iPad, or other Mac iOS device has steadily grown, increasing by more than 800%. Additionally, Replicon has seen a 20% increase in daily use of the platform due to users logging in via mobile device. The company estimates that more than half of its users will regularly access the hassle-free Replicon platform via a mobile device before the end of 2012. Replicon’s market-leading time and expense software offerings are the only solutions that provide a complete hassle-free experience for organizations of all sizes. As a result, customers experience rapid adoption, faster time- to-value with quick implementation, pain-free seamless upgrades and complete on-going maintenance of their system 24x7x365 - making it the solution of choice for customers who need a worry-free system. Blackberry and Android versions of Replicon Timesheet are currently in development and will be released later this year. 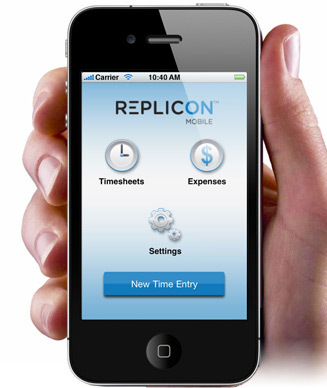 Replicon is the leading provider of cloud-based time sheet software with over 1.5 million users in 70 countries. For over 15 years, Replicon has empowered thousands of companies of all sizes to increase their productivity and profitability by providing hassle-free time and expense management capabilities and superior customer service. Our growing suite of fully-integrated applications provides a complete solution for any time tracking need including professional services, IT chargebacks, project costing, time & attendance, time off and more.